Today I’ve written a guest post over at Rose’s blog, Simple Wings . Rose shares her journey toward simplicity and success as a striving minimalist and university student. If you like Minimal Student, I highly recommend you check out her blog. As a facet of simplicity, minimalism is largely misunderstood and can be a wonderful way of inviting simplicity into your physical space. 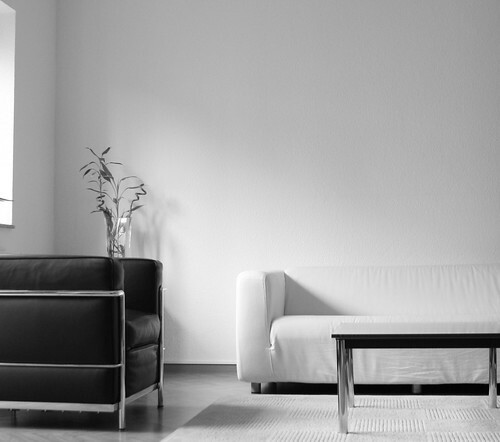 Today, Jessica of Minimal Student talks about her experiences of minimalism. Minimalism. The word has so many ‘new-age’ connotations attached to it that when people outside what I like to call the ‘minimalism/simplicity sphere’ hear it they immediately think of somebody living in a hut in a forest without a phone, computer or television. Or they think of bare and boring houses with cheap furniture and everything hidden away. I’ve found from what little experience I have that when I say ‘no thanks’ to buying more clothes or carrying more luggage on trips in front of people I tend to get puzzled looks. When people walk into my bedroom they’re a little shocked by the simple lack of stuff. My wardrobe is only half full, I don’t have papers all over my desk or knick-knacks on my bedside table. All I own is just my guitar, laptop, some clothes and a few books. Everything else, including my furniture and bike, is rented. Some would say that my room looks cold and impersonal . Actually, I think it’s the very opposite. Minimalists only buy what is essential. This means that almost everything they DO have was subjected to intense scrutiny before purchase. Each item has to pass all of the questions: ‘Do I need it or do I just want it? How often will I use it? Is it worth it?’ With a little perspective and willpower, not very many items pass the minimalist tests. So, you see, instead of being another ‘throw-away’ or ‘why not’ purchase, each item is actually carefully chosen by minimalists, to make sure that they have enough love and time to care for it. Believe it or not, for every item you own, you pay for it in some way, whether it is by the bigger house you rent to store it, or the time you spend cleaning, maintaining or fixing it. If you have fewer things, you have fewer costs. If you have fewer costs, you have more freedom. It’s so simple and seems to obvious, and yet too many people clutter up their lives with unnecessary things. Think about the millions of home with basements, attics, lofts and sheds full of boxes, crates and tubs of things that they haven’t touched in years. If these people had a fire, most of that stuff wouldn’t be worth grabbing. If they wanted to move house, or start an adventure, the only way they could do it is by dropping everything that they don’t need and hit the road. If they don’t need something that much, then why not ditch it now? I’m not saying that everyone should be ready to go backpacking in Australia tomorrow. What I’m saying is that minimalism allows a person to not be weighed down by all of the material things they own, or want to own. Instead of spending one’s life earning more money so that they can buy more stuff why not just buy what they need and use the money to help other people. Instead of working eight hours a day to pay for the second car or a larger house to store all their stuff, they could use that time to nurture meaningful relationships with their partners, getting closer with family or making life long friends. They can pursue their passions, broaden their horizons or just spend time sitting back, relaxing and enjoying life. So, those people that thought minimalism is living away in a hut, they got it half right. Perhaps not the hut part, but definitely the part where you can get away from the stresses and expectations of life. Minimalism is about living life how you want, to the fullest, because, after all, the person with the most toys isn’t the winner, it’s the person who has the most fun with them that wins. This entry was posted in Minimalism on February 17 2010 by Jessica.